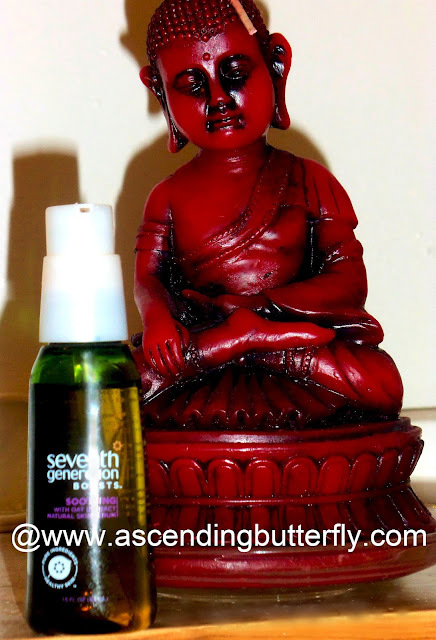 #ad: I received a free sample of this product from Lucky and Seventh Generation for editorial consideration. For me Beauty always begins from the inside out. My mind, body and spirit have to be aligned and in the right place for the external to reflect the same. Taking time for meditation and getting myself centered helps me to discover my inner beauty. And thanks to Lucky Magazine and Seventh Generation I found a Natural Skin Serum that helps me keep my outer glow beautiful with a simple 'boost'. Instructions: Apply 1 to 2 pumps to fingertips and massage into damp skin. Seventh Generation Boosts actually does what it says, it's a perfect boost to your skin, and also boosts your sunscreen perfectly! I find most products that contain sunscreen to be very thick, and using Boosts with my sunscreen makes it easier to apply. It has a nice liquid consistency to it, goes on easy, and feels just a little tacky to the touch when you first put it on your face, but it absorbs quickly and easily and leaves my skin soft and smooth after. You can easily incorporate it into your existing routine, by adding it to your sunscreen by day and your night cream at night. This does NOT make my face break out, good argan oil shouldn't, and this one does not cause any breakouts on my skin. And trust me, my skin is acne prone and can get super sensitive, and I've had no reactions to this serum except softer, 'boosted', skin and a radiant me! FTC Disclosure: Lucky Magazine and Seventh Generation provided a sample of Boosts for editorial consideration, all opinions are 100% my own, no monetary compensation has been received, but this entry does make me eligible for additional incentives and serves as a contest entry. I am a member of the Lucky Community and am participating in the Lucky Community Challenge. You may visit our full giveaway and disclosure page for complete policy information. This sounds like a great little addition to the beauty routine. My skin and hair are really loving the argan oil trend! @Mer - Same here! Argan has been working wonders for my skin and hair as well! I was a bit hesitant at first about using it on my skin as I thought it would make me break out more, but it really hasn't, which was a great surprise!